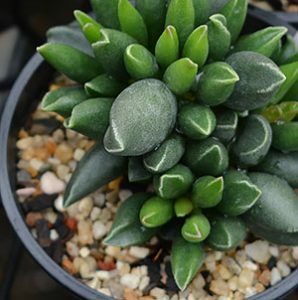 Adromischus are a group of succulents from Southern Africa to Namibia. With around 30 species and much variation with each species, they are best described as small growing clumping plants. Adromischus marianiae is one of the most sought after varieties many of this group grow well in full sun and in fact will turn to wonderful colours in this situation. Most of the group is used to dry summers and wet winters, however they do naturally grow on rocky hillsides where drainage is excellent. All species require a free draining soil mix, extra grit or other material is usually a aded. They are compact growing however will form a good sized clump over time. It is recommended to repot specimens each year using a fresh potting mix and a little slow realest type fertiliser. The watering schedule will depend a little on the climate and if grown outdoors or indoors. Generally less water in summer is recommended, in late summer increase watering and in winter water around once every two weeks, once the growing medium is dry. Watering can be increased again in spring. In winter, avoid watering the foliage, especially indoors or in warm to temperate climate. Water the foliage in winter can cause fungal problems. The easiest method of propagation is by removing offsets, however this depends on the species. Leaf cuttings are also reliable. Propagation from seed is also possible. Powdery Mildew – Caused by damp conditions and poor air circulation. Snails and Slugs – Especially on new growth. 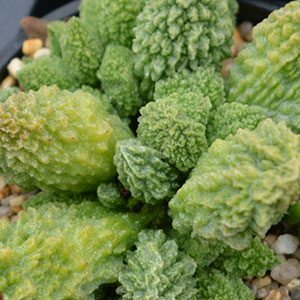 A. marianae – A variable species with thick foliage generally with pale olive green and maroon markings. The herii varieties have green foliage, heavily textured. A. triflorus – Again mottled foliage that has a truncated appearance. A. clavifolius – Very attractive form with rounded foliage. A. cooperi – Interesting Green and Maroon mottled foliage. A. filicaulis – A desirable form with thick foliage. A. maculatus – Olive green foliage with deep maroon foliage.